Pensacola, Fla. (April 11, 2018) – It’s no secret that the Pensacola Bay Area seemingly wakes up on the first day of spring with beautiful weather and a calendar full of events lasting well through the fall festival season. Thanks to the county’s strong focus on tourism, these activities are possible. Setting sail for the first time in history this weekend, Visit Pensacola, in partnership with Tall Ships America®, is excited to present Tall Ships® Pensacola. 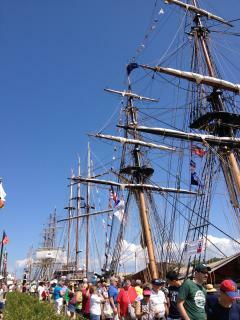 “With its maritime history, Pensacola was the perfect match for Tall Ships America®. The festival is a unique, attractive event for visitors and locals alike that they are sure to enjoy during this once in a lifetime opportunity,” Director of Marketing and Communications Nicole Stacey said. Additionally, sports tourism is on the rise with outside travelers wanting to experience the white sand beaches and thriving downtown that Pensacola boasts. This weekend alone, six area events are contingent upon it. The tourism industry provides the county with nearly $800 million in direct visitor spending and employs more than 22,300 Escambia County citizens, all of which support events in the community that supply a wide range of benefits to residents and visitors alike. For a complete list of tourism-related events in Escambia County, visitvisitpensacola.com/events/. For a complete list of sports tourism-related events in Escambia County, visitpensacolasports.org/events/. Visit Pensacola is the destination management organization for Escambia County which includes Pensacola, Pensacola Beach and Perdido Key. With over 450 years of rich history and 18 miles of sugar-white sand beaches bordered by the emerald-green waters of the Gulf of Mexico, visitors from all over the world are lured to our pristine shores every year. Visit Pensacola supports the community vision of tourism by serving as the central body responsible for building tourism as an economic engine for our community through leadership, connection, collaboration and communication.